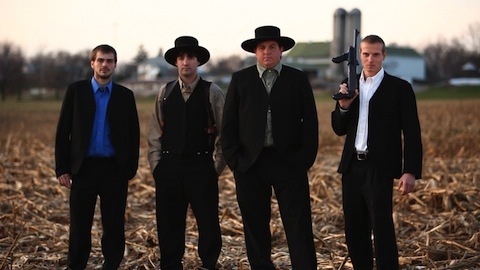 In the silliest vie for eyeballs I may have ever encountered, Discovery Channel has put together Amish Mafia, a new reality TV series set to premiere next month on the network. The show is exactly what it sounds like—a poorly dressed version of the average neighborhood watch. Back in 2006, a non-Amish milk truck driver went into a Pennsylvania school district, willingly disrupted the classroom environment, and subsequently killed five young women belonging to the Amish community and injured several others. This event is tragic, and is probably the most compelling aspect of Amish Mafia. However, it’s all downhill (and often reenacted) from here. In order to protect the Amish community in Lancaster County, Lebanon Levi has put together a team of individuals willing to go out on a limb to protect the community. His team includes his buddy, Alvin, Mennonite-but-not-Amish believer Jolin, and young John. His team is unprecedented in the Amish community and has been denied by the church (shocker). However, he does act as police and judge within the small community, and Amish wrongdoers better watch out. Seriously, though, the next time you know someone is on Rumspringa and is causing a ruckus, who you gonna call? Amish mafia! Oh wait, the whole 'call' thing is probably out, too. The series is being executive produced by Eric Evangelista and Shannon Evangelista, alongside Discovery Channel’s Dolores Gavin and Matt Kelly. You can catch a sneak peak at the series on Tuesday, December 11 at 10:30 p.m. ET. The series will officially premiere on December 12 at 9 p.m. ET. Don’t worry, though, if you miss it—I doubt you’re missing much.